Englander Pellet Stove Convection Blower, PU-4C442-AMP. The Englander Pellet Stove Convection Blower pushes warm air into the room. Replacement Englander blower motor for existing room air (convection) blowers on Englander pellet stoves. Works with many Englander pellet stoves 140 CFM is ideal for a small room Complete assembly with gasket included Includes wire leads for fast "plug and play" installation Includes detailed step-by-step installation instructions or you may reference the instructional video below IMPORTANT: For all pellet stove models listed on this page except 2002 and newer "Deluxe" freestanding and insert pellet models ("Deluxe" models have louvers beside the door and include Englander models 25-PDV, 25-PI, 55-SHP22, 55-SHP20, 55-TRP22, 55-TRP20, 55-SHP22L and American Heritage models). For Models 2002-Present Use # PU-4C447 If 2002 or newer "Deluxe" model, see Part Number PU-4C447 Convection Blower. NOTE on Older Models: Model years 1989-90 use one room air blower; Model years 1991-95 use two room air blowers. If 1991-95 model, stand behind the stove and determine if "left" or "right" blower, and note this in the "Ordering Instructions" box in your Shopping Cart. Model years 1996 and later use one room air blower. We also carry a variety of other Englander Pellet Stove Parts to upgrade or repair your stove. SKU: PU-4C442-AMP (20059K) MPN: PU-4C442. 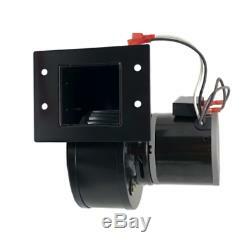 Englander Pellet Stove Convection Blower motor for models 25-EP, 25-EPI and 25-PDVC made before 2002. Works with many Englander pellet stoves. 140 CFM is ideal for a small room. Complete assembly with gasket included. Includes wire leads for fast "plug and play" installation. Includes detailed step-by-step installation instructions or you may reference the instructional video below. IMPORTANT: For all pellet stove models listed on this page except 2002 and newer "Deluxe" freestanding and insert pellet models ("Deluxe" models have louvers beside the door and include Englander models 25-PDV, 25-PI, 55-SHP22, 55-SHP20, 55-TRP22, 55-TRP20, 55-SHP22L and American Heritage models). For Models 2002-Present Use # PU-4C447. If 2002 or newer "Deluxe" model, see Part Number PU-4C447 Convection Blower. We also carry a variety of other. To upgrade or repair your stove. Englander:, 25-PDVC, 55-SHP10, 55-SHP10L, American Standard, 25-PDV (Before 2002), 25-PDVE (Before 2002), 25-PI (Before 2002), 55-SHP22 (Before 2002), 55-SHP20 (Before 2002), 55-TRP22 (Before 2002), 55-TRP20 (Before 2002), 55-SHP22L (Before 2002), American Heritage (Before 2002), 55-TRP10, 25-EP (Evolution Pellet), 55-SHPEP, 55-SHPEPL, 55-TRPEP, 25-EPI, 55-SHPEPI, 55-SHPEPIL, 55-TRPEPI. Volts: 115, Cycles: 60, Amps: 0.79, Rpm: 3000. No additional information at this time. Need to return an item? 2 Alumininum Flex Pipe For outside air venting only, 10FT. 2 Aluminum Flex Pipe For outside air venting only, 5FT. 3" x 6" Simpson PelletVent PRO Straight Length Pipe. The item "Englander Pellet Stove Convection Blower, PU-4C442-AMP" is in sale since Monday, August 20, 2018. This item is in the category "Home & Garden\Home Improvement\Heating, Cooling & Air\Fireplaces & Stoves\Replacement Parts". The seller is "stove-parts-4-less" and is located in North Falmouth, Massachusetts. This item can be shipped to United States.